Water evaporation in the Dead Sea valley contributes significantly to sea level drop and varies as a function of the season and meteorological conditions. Within the framework of the HEADS measurement campaign, researchers of Karlsruhe Institute of Technology (KIT) study evaporation, the vapor layer, and local wind systems. The measurements are embedded in the Helmholtz Virtual Institute "DESERVE – Dead Sea Research Venue" in which scientists from Germany, Jordan, Israel, and Palestine cooperate. The Dead Sea is a closed system that is situated 428 meters below the sea level. Its average salt concentration is 28 percent. In this worldwide unique natural area with a salt sea, stone desert, semi-desert, and Mediterranean landscapes, environmental changes take place very rapidly. The findings obtained by climate and environmental researchers in this area can also be transferred to other regions with slower change processes. At the DESERVE Helmholtz Virtual Institute, scientists from Germany, Jordan, Israel, and Palestine cooperate. The activities are coordinated by the KIT. "The relationship among the researchers is characterized by fruitful scientific exchange and mutual respect," Dr. Ulrich Corsmeier, head of a research group of the Institute of Meteorology and Climate Research – Troposphere Research Division (IMK-TRO) and co-initiator of DESERVE, reports. The interdisciplinary project links meteorology with hydrology, geophysics, and earth system sciences and focuses on the three big topics of water availability, climate change, and environmental risks. Within the framework of DESERVE, the KIT scientists presently are conducting the measurement campaign HEADS (Heat and Evaporation at the Dead Sea). 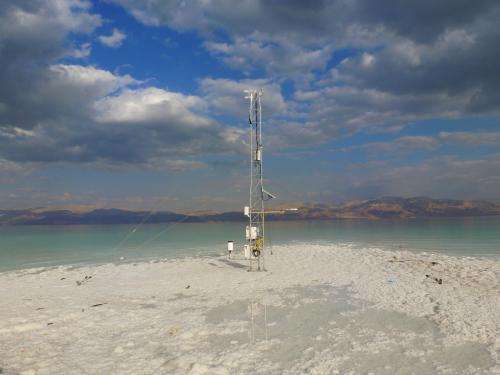 To collect data on vapor and evaporation ratios in the summer and winter in the Dead Sea valley, they use the KITcube. This observation system of IMK-TRO measures a "cube", i.e. a section of the atmosphere with an edge length of about ten kilometers. Various measurement instruments for all relevant meteorological parameters are integrated in the KITcube. A first overview of the data confirms that evaporation considerably contributes to the drop of the water level of the Dead Sea by more than one meter per year. "This is an average value. Evaporation varies as a function of the annual season and meteorological conditions," Ulrich Corsmeier explains. When the wind is strong enough to have an influence in the valley about 400 meters below the sea level, air humidities may be less than 10 percent, which is hardly encountered anywhere else on earth. Parallel to the sea level, the groundwater levels drop as a result of freshwater flow into the Dead Sea. This does not only endanger the supply of the region with drinking water - more than 4 million people are dependent on the underground water resources. The freshwater flows also dissolve underground salt layers, which produces cavities that eventually collapse. Such sinkholes endanger buildings and lead to the abandonment of agricultural areas. In addition, gigantic flashfloods are a problem. They occur after locally limited strong rainfalls that cause rapid discharge processes. However, total precipitation in the region has been decreasing since several years. With the help of the KITcube measurements and a network of meteorological measurement stations, the IMK-TRO scientists determine evaporation rates above water, desert ground, and the reed zone. Based on all measurement data, the scientists plan to set up a total water balance. For this purpose, the KIT researchers closely cooperate with scientists of the Helmholtz Center for Environmental Research (UFZ), Leipzig. Apart from the water budget, water availability, and geophysical phenomena, such as sinkholes and flashfloods, interaction processes of the atmosphere (air), hydrosphere (water), and lithosphere (ground), and geophysical risks, such as earthquakes, are in the focus of DESERVE. Another important aspect is the education and qualification of young scientists. In late November/early December, DESERVE organized an interdisciplinary winter school of twelve days' duration at Masada/Israel. 25 students, doctoral candidates, and post-docs from Germany, Jordan, and Israel took part. In the 21st century, living conditions on Earth are changing as drastically as never before. Hence, climate and environmental research is facing big challenges. More than 650 scientists of some 30 institutes of the KIT Climate and Environment Center are developing strategies and technologies to secure the natural bases of life.